Discussion in 'General Science & Technology' started by paddoboy, Jan 29, 2017. Berkeley-led study finds law-breaking property in vanadium dioxide that could lead to applications in thermoelectrics, window coatings. There’s a known rule-breaker among materials, and a new discovery by an international team of scientists adds more evidence to back up the metal’s nonconformist reputation. According to a new study led by scientists at the Department of Energy’s Lawrence Berkeley National Laboratory (Berkeley Lab) and at the University of California, Berkeley, electrons in vanadium dioxide can conduct electricity without conducting heat. The findings, to be published in the Jan. 27 issue of the journal Science, could lead to a wide range of applications, such as thermoelectric systems that convert waste heat from engines and appliances into electricity. Quite an informative article, which goes on to describe the methodology and the fact that there are a handful of other materials besides vanadium dioxide that can conduct electricity better than heat, but these only occur at temperatures hundreds of degrees below zero, making it far more challenging to apply to real-world applications. "According to a new study led by scientists at the Department of Energy’s Lawrence Berkeley National Laboratory (Berkeley Lab) and at the University of California, Berkeley, electrons in vanadium dioxide can conduct electricity without conducting heat." Hype. Later we learn the truth - thermal conductivity is around 10% of usual for metals with a given electrical conductivity. Since when is 10% = 0%? Further, while VO2 has a Rutile metallic conduction phase, to call it a metal as the article does throughout seems a stretch. It will remain a brittle oxide with zero ductility - ductility being one distinctive hallmark of a true metal. Also it's colour - deep blue - is totally uncharacteristic of a true metal. One needs to be switched on and reasonably conversant with the general area of materials science to see journalistic licence at work yet again. Otherwise it will be a case of awe-struck 'gee whizz' amazement. And covers more properties which are indeed interesting and technologically valuable. dumbest man on earth and exchemist like this. You actually should be aware of journalistic sensationalism, although 10% is still rather an awesome outcome in most reasonable people's minds. 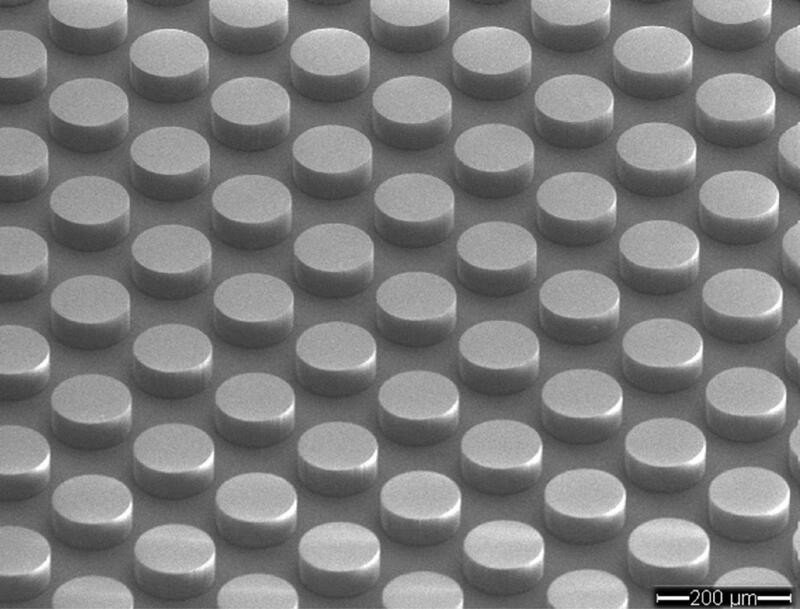 Electrical engineers at Duke University have created the world's first electromagnetic metamaterial made without any metal. The device's ability to absorb electromagnetic energy without heating up has direct applications in imaging, sensing and lighting. Metamaterials are synthetic materials composed of many individual, engineered features that together produce properties not found in nature. Imagine an electromagnetic wave moving through a flat surface made of thousands of tiny electrical cells. If researchers can tune each cell to manipulate the wave in a specific way, they can dictate exactly how the wave behaves as a whole. For researchers to manipulate electromagnetic waves, however, they've typically had to use electrically conducting metals. That approach, however, brings with it a fundamental problem of metals—the higher the electrical conductivity, the better the material also conducts heat. This limits their usefulness in temperature-dependent applications. But please read the full article before you go off half cocked again, OK? Metamaterial absorbers consisting of metal, metal-dielectric, or dielectric materials have been realized across much of the electromagnetic spectrum and have demonstrated novel properties and applications. However, most absorbers utilize metals and thus are limited in applicability due to their low melting point, high Ohmic loss and high thermal conductivity. Other approaches rely on large dielectric structures and / or a supporting dielectric substrate as a loss mechanism, thereby realizing large absorption volumes. Here we present a terahertz (THz) all dielectric metasurface absorber based on hybrid dielectric waveguide resonances. We tune the metasurface geometry in order to overlap electric and magnetic dipole resonances at the same frequency, thus achieving an experimental absorption of 97.5%. A simulated dielectric metasurface achieves a total absorption coefficient enhancement factor of FT=140, with a small absorption volume. Our experimental results are well described by theory and simulations and not limited to the THz range, but may be extended to microwave, infrared and optical frequencies. The concept of an all-dielectric metasurface absorber offers a new route for control of the emission and absorption of electromagnetic radiation from surfaces with potential applications in energy harvesting, imaging, and sensing. Nice of you to hijack your own thread and introduce a separate topic. I guess you must be up on forum guideline changes the rest of us are unaware of? Whatever, as a site-stats boosting mega-posting darling, there will be no smack over the wrist for paddoboy. But anyway, now that it's been posted, in two installments as per your usual habit, I will point out to you what you have no hope of realizing by yourself. More journalistic licence. Yep. The article Abstract claims "However, most absorbers utilize metals and thus are limited in applicability due to their low melting point, high Ohmic loss..."
Err, which metals, and high losses compared to what else? Surely not tungsten re melting point, or even ohmic losses compared to boron-doped silicon. Which is not an insulator but a semiconductor. Still, at the terahertz frequencies used, I have no doubt there are some advantages to using the metamaterial structure re #4 & #5. Just be careful of the fine detail of claims being made. As I said, most reasonable people accept journalistic sensationalism at times. You need to accept that. With your usual pessimistic view, again, taken with a grain of salt for many reasons and accept the professional optimistic view: And obviously in this case as with others I have posted, worthwhile research will continue and so it should. Pessimists see difficulty in every adventure, Optimists see opportunity in every difficulty...or words to that effect. A famous quote by an old Politician btw! And you need to stop insinuating falsehoods. As though I somehow 'don't accept that', rather than being up to recognizing and pointing out such abuses where appropriate. So for now you are chastened re plagiarism, but continue this fool habit of using words out of context. Accusing me of 'pessimism' where 'observant' would be appropriate. What's new. Please avoid ad hominem attacks on other members. No, telling it as it is. Whatever your agenda leads you to fabricate in your mind. And I'll stick to pessimism thank you very much, I believe you have shown that beyond reasonable doubt. ...And I'll stick to pessimism thank you very much, I believe you have shown that beyond reasonable doubt. OK you stick with that. No-one else cares. Just curious... Is it your mission in life to follow paddo from thread to thread for the sheer fun of harassment? You are joking, right? Or you have only the barest awareness of our history of engagement and who it is that has overwhelmingly been the instigator of senseless attacks? I'm of the opinion that irresponsible behaviour should not be rewarded either by active encouragement or passive inaction. Evidently very much a minority opinion at SF. But opinions vary. dumbest man on earth and Boris2 like this. And of course, at the risk of repeating myself, the bottom line is that research into areas such as you have seemingly derided over the last few days, will of course continue, for many obvious reasons. Except that, my criticisms have been valid and on target. As I have a grasp of the topics you never will. Unlike your own disjoint rants that breach forum guidelines routinely - yet without penalty. The science enthusiast without any capacity to critically evaluate any aspects of the science he so avidly flag-waves for. But so few care either way. As observed elsewhere, might as well rename this site to something more appropriate to a political/ideological oriented 'discussion' i.e. arguing forum. Aha yes, thanks very much for this. Now it all makes sense. I couldn't understand why VO2 was being described as a "metal" in the first place. As you say, the Wiki article explains a lot, including this interesting phase transition at 68C, in which metal-metal bonds break, the distortion disappears and the released bonding electrons become able to provide electrical conductivity. At lower temperatures I see it is described as a semiconductor. So indeed the article is quite misleading. dumbest man on earth and Q-reeus like this. Why can't you shut up and stick to the science, once in while? I do get pissed off with this constant coat-trailing. This is potentially a good thread. Why wreck it? dumbest man on earth, Boris2 and Q-reeus like this. Except that, my criticisms have been valid and on target. As I have a grasp of the topics you never will. Unlike your own disjoint rants that breach forum guidelines routinely - yet without penalty. The science enthusiast without any capacity to critically evaluate any aspects of the science he so avidly flag-waves for. But so few care either way. As observed elsewhere, might as well rename this site to something more appropriate to a political/ideological oriented 'discussion' i.e. arguing forum. Critically evaluiate all you like, but don't pretend that you are the be all and end all of scientific content or opinion on this forum, because guess what, you aint. I see you quickly coat trail exchemist, yet admonish me for similar likes. As usual qreeus, my threads on interesting research in all fields will continue, despite your opposition to such. I do stick to the science despite childish "get square" rants from qqqquarters that have had their fingers burnt elsewhere. Sorry you feel that way exchemist. No wrong. As usual some sensational headlines but the article covered the facts throughout. At least no one appears to be doubting that research should continue. Whatever you say. Now, any further useful input on either of the two topics you managed to fit into this thread? All Q-reeus was originally doing was to pour a bit of (justifable) cold water on yet another gosh-wow journalist's article, by referring tot he actual science involved and distinguishing between what is new and what was already known about this material. Both posts were useful but, as so often, it is the person more familiar with the science who has more to bring to the party. The material is an oxide, not a metal, but it has some interesting bonding which causes this strange flip between conducting and semiconducting behaviour. So now we know. By the way, you don't coat-trail someone, you just trail your coat. The point is that 10% of a 100% is awesome and outstanding, despite what some like to pretend whose only claim to fame is on sciforum.